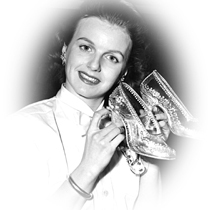 Ilene Woods, the voice of Disney’s Cinderella and Disney Legend, has died at age 81. Woods is most famous for her role as the voice of Cinderella in the 1950 classic animated film. One of her last film appearances was in Touched By An Angel as night nurse Cassie. The cause of her death has not been disclosed at this time. In 1948, as a favor for songwriter friends Mack David and Jerry Livingston, Ilene recorded “Bibbidi-Bobbidi-Boo,” “A Dream Is a Wish Your Heart Makes,” and “So This is Love.” She didn’t know that Walt Disney would hear the demo recordings and hire her as the title voice of his upcoming animated feature “Cinderella”. After Cinderella, Ilene moved on to television appearances in programs such as The Steve Allen Show and in later life became a portrait artist. On February 12, 2001, she appeared at a Cinderella Ball celebrating the 50th Anniversary of the motion picture, held at Disneyland. In 2003 she was inducted as a Disney Legend, an award that honors individuals whose “imagination, talents and dreams have created the Disney magic”.